Gravity is the magic glue that holds the ball earth theory together. Whenever there is any question as to how it works the answer from the scientists is almost invariably “gravity”. Science informs us: “Gravity is a natural phenomenon by which all things with mass are brought toward (or gravitate toward) one another, including objects ranging from atoms and photons, to planets and stars. Somehow gravity magically and inexplicably drags the entire lower-atmosphere of the Earth in perfect synchronization up to some undetermined height where this progressively faster spinning atmosphere gives way to the non-spinning, non-gravitized, non-atmosphere of infinite vacuum. Flat earthers say that if this was the case fireworks and rain would behave differently than what we experience. This is perhaps an incorrect assumption as if, in theory, the whole atmosphere and everything in it could spin with the earth at a constant speed gravity could attract the rain, fireworks, etc, to the center of the globe earth. They question how the atmosphere can exist right next to the void of space and what is stopping the atmosphere from being sucked out into space. If we ask the scientists I am sure they will answer, “Obviously it is gravity…” But this is not a very satisfying or convincing answer. Flat earthers are also skeptical that gravity can keep all the water in the oceans stuck to the surface of the planet while it is spinning and wobbling its way through the universe. They show the example of putting a wet tennis ball on a drill and spin it and we see the water does not stick to the tennis ball, on the contrary, it flies out everywhere. Of course the answer from science is simply “the oceans are held in their place on the surface of the globe by gravity.” So the natural question would be that if gravity is so strongly holding the oceans in place why does gravity allow little birds, bugs and planes to take of and travel freely in any direction they choose? Flat earthers contend that gravity does not exist and what when we experience objects falling it is not caused by gravity but rather the simple fact that more dense objects will fall in a less dense atmosphere. Which is exactly what we see happening. If we drop something more dense than air it will fall, but if we drop a helium filled balloon, lighter than air, it will not fall, gravity has no effect on it, instead it will rise up. Also gravity does not have any effect in the water for items that are less dense than water. So flat earthers contend we are seeing density, not gravity acting in these cases. Conclusion: Gravity is certainly a magical mystery and much more research is needed in this area. The flat earthers are raising very interesting questions in this regard. My dude, that picture you put in isn’t helping you (at least i n my opinion). Gravity pulls the ocean down, or should i say, gravity keeps the ocean down because the ocean does not exert any force against gravity besides the molecules moving into openings( like all liquids do). The bird can fly because it is exerting force against gravity. I’m a seventh grader, if some kid can do this, then I’m pretty sure you (the person who created the picture and who ever supports the message of the picture) can. And did you know that even baseballs have a gravitational force? You say gravity keeps the ocean down, and you imply that the ocean does not exert any force on gravity. That is incorrect. If you take a tennis ball and wet it and put it on the end of a drill and spin it around the water will not stay on the tennis ball. It will spread out due to centrifugal force. So if you have a ball spinning in the sky and try and put water on it the water will not stay, it will spin off due to centrifugal force. So if gravity is keeping the ocean down, as you say it is, and as we have to believe it is, if we are on a spinning ball. But there is a force which gravity has to fight against to keep the ocean down. The oceans will spin off the spinning earth due to centrifugal force, if they are not held down by gravity. So if you make a calculation of how much water is in the ocean and work out how heavy all the water in the ocean is you will start to understand what an immense force gravity has to exert on the oceans to keep them from spinning off into space. Then, I think, once you understand this, you will be able to appreciate the picture better. 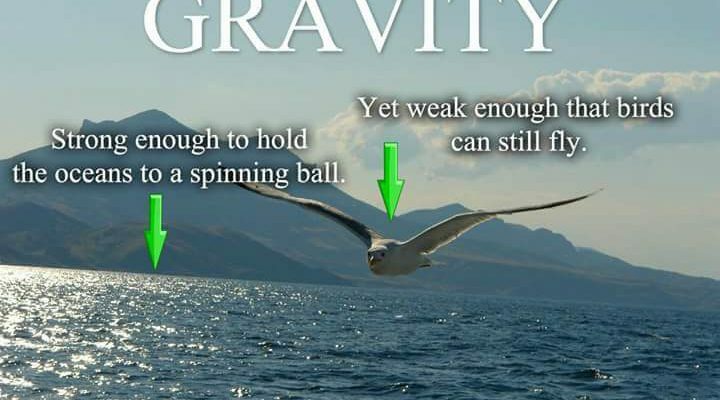 How can gravity exert such a strong force on the oceans, keeping them from spinning off into space, as we would expect them do to on a spinning ball. And at the same time allow a bird to effortlessly fly in the sky? There is a great contradiction here. So this falling down and rising up is caused by density, not gravity. We fall down towards the ground because we are more dense than the air, but if we, like the helium balloon, were less dense than the air, we would float up into the sky. So there is no gravity. It is density.